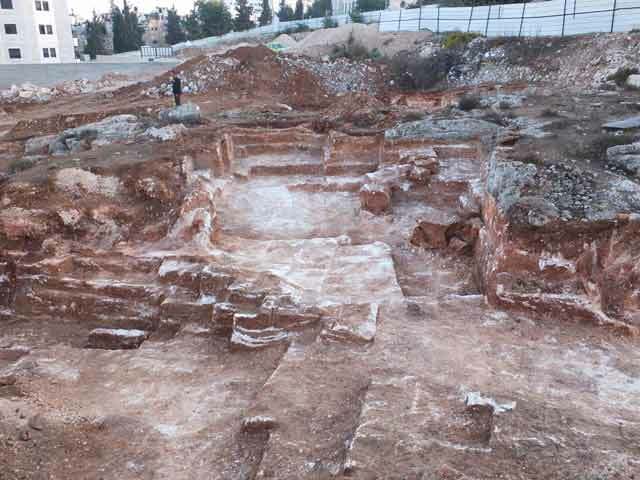 In October 2014, a salvage excavation was conducted in the Beit Hanina neighborhood of Jerusalem (Permit No. A-7230; map ref. 221763–87/638412–61), prior to development work in a private lot. 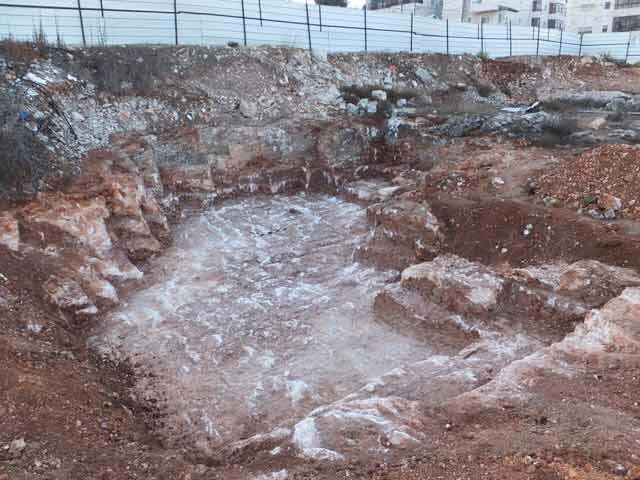 The excavation, undertaken on behalf of the Israel Antiquities Authority and financed by Mr. A. Shufra, was directed by D. Yeger, with the assistance of N. Nehama (administration), A. Hajian, M. Kahan and M. Kunin (surveying and drafting), C. Arbib and B. Dwyat (antiquities inspection), D. Levy (GPS) and B. Touri. Three ancient courtyard quarries (Figs. 1, 2) were exposed between el-Arshid Street and Nusseiba Street, on the northern slope of a hill that descends toward Nahal ‘Atarot. 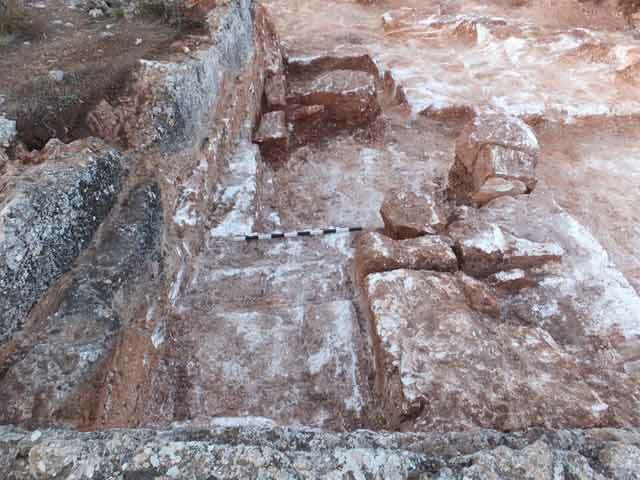 Two of the quarries were not completely excavated due to technical reasons. 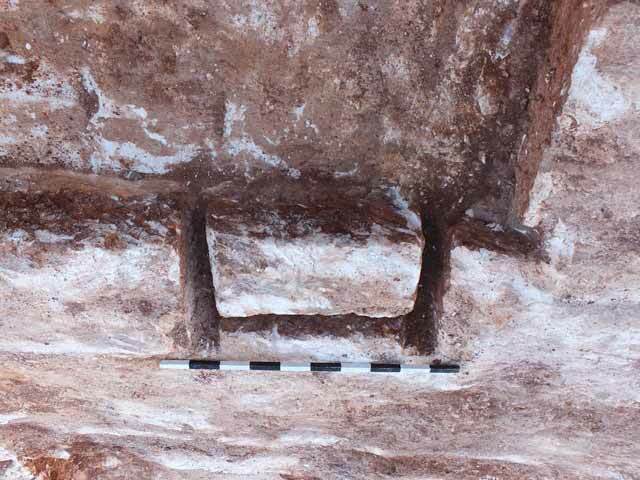 Numerous ancient quarries dating to the Roman and Byzantine periods were discovered in surveys and excavations previously conducted at the site (Adawi and Touri 2014; Yeger 2014a; Yeger 2014b; Yeger 2015). 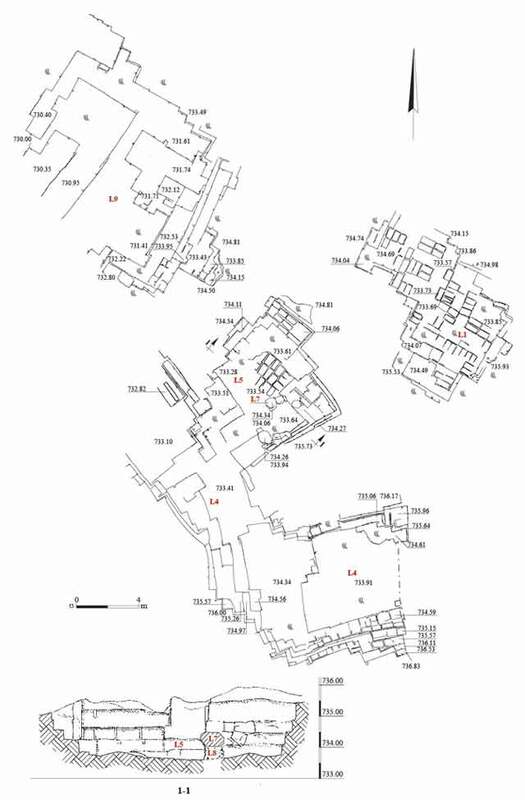 The two southern quarries (L4, L5) and the northern one (L9) were of the large courtyard type, whereas the eastern quarry (L1) was a medium-sized courtyard quarry (Safrai and Sasson 2001:4). Numerous quarrying steps with vertical bedrock walls, chisel marks (Fig. 3), separation channels, severance channels and stones that were not detached from the bedrock (Fig. 4) were discovered in them. The upper part of the separation channels were wide (10–13 cm), and their lower part were narrow (3–4 cm); their dimensions varied in accordance with the size of the stones that were hewn. Diagonal chisel marks (width 1–2 cm, depth 0.5 cm; Fig. 5) were visible on the walls of the quarry. The stones that were produced there were usually uniform in size (0.30 × 0.36 × 0.60 m), although some varied in size (0.8 × 0.9 m on average). The method employed in hewing the stones is known from other quarries in the vicinity. First, vertical separation channels were cut along three of the stone’s perpendicular sides, and then a channel was hewn beneath the stone, thereby severing it from the bedrock. A layer of quarrying debris (max. 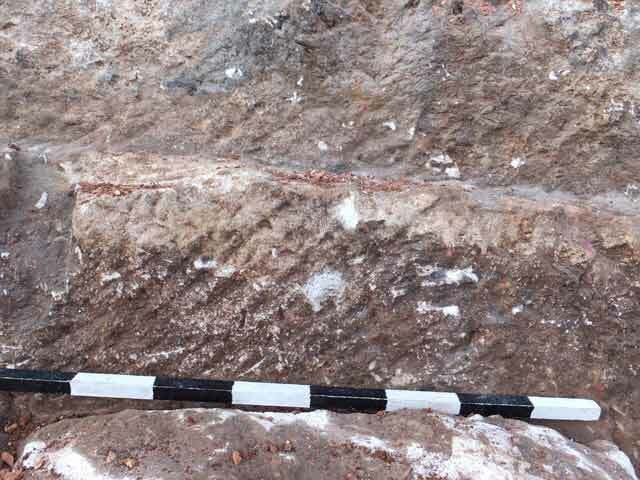 thickness 0.4 m) was discovered at the bottom of each quarry; it was covered by an accumulation of reddish brown terra-rossa soil (thickness 0.5–1.0 m). The southern quarry included two courtyards (L4, L5) connected by a narrow corridor. 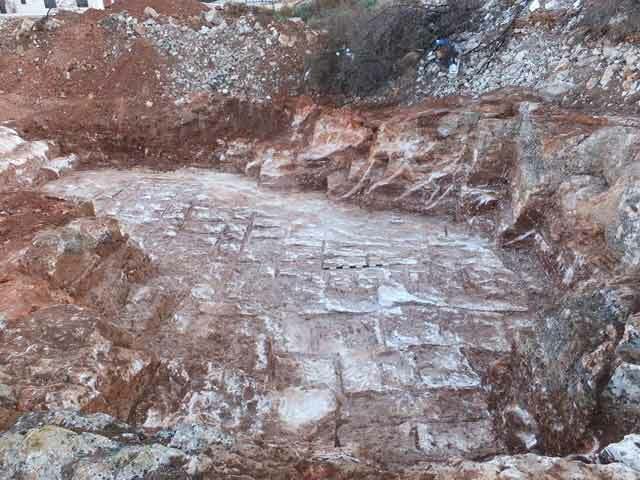 Quarrying steps that descended to the north were discovered in Courtyard 4 (10 × 18 m, max. depth 2.4 m; Fig 6). The northern wall of the courtyard was vertical and rather straight. A broad quarrying step was found in the northern corner. A corridor led from the western part of the Courtyard 4 to Courtyard 5 (8 × 10 m, max. depth 1.5 m; Fig. 7), the smaller of the two. 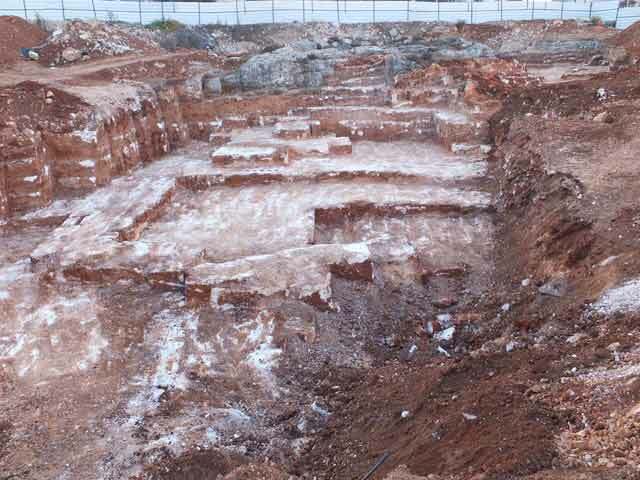 Above the quarrying debris (L8) in the southeastern corner of Courtyard 5 was a layer of stone slabs and large fieldstones (L7; Figs. 8, 9) that abutted the courtyard’s northeastern wall. Fragments of a Plain Byzantine Ware bowl that dates from the second half of the fifth century to the seventh century CE were discovered in the layer of quarrying debris. Several quarrying steps that descended toward the west were discovered in the southeastern wall of the northern quarry (L9; 14 × 16 m, max. depth 1.9 m; Fig. 10). The northeastern wall was vertical and generally straight. 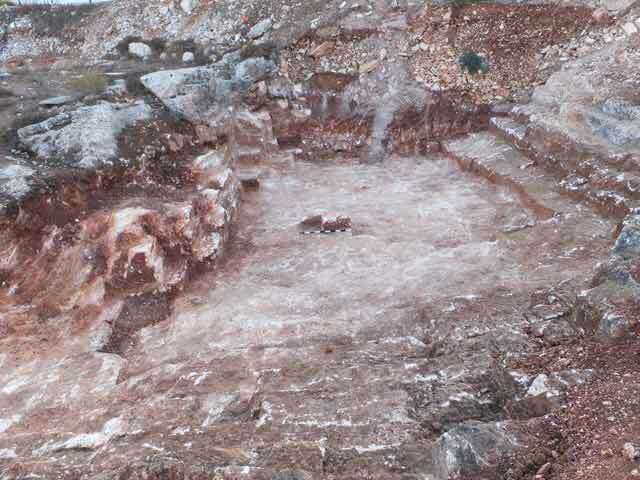 The quarry’s northwestern and southwestern walls were not discovered, as the quarry probably extends beyond the excavation area to the west and south. The southern side of the quarry may connect to the corridor that linked Courtyards 4 and 5. The eastern quarry (L1; 10 × 11 m, max. depth 1.8 m; Fig. 11) sloped to the west; there were a few quarrying steps in it, and its walls were generally vertical and straight. The quarrying technique and the plans of the quarries attest to the knowledge, pre-planning and organization that enabled several groups of laborers to work simultaneously in the quarries. The artifacts discovered in the excavation were meager, but since they were found sealed beneath the layer of stones that abutted the wall of the courtyard when the quarry was still in operation allows us to date its use to the late Byzantine and Umayyad periods (fifth–seventh centuries CE). 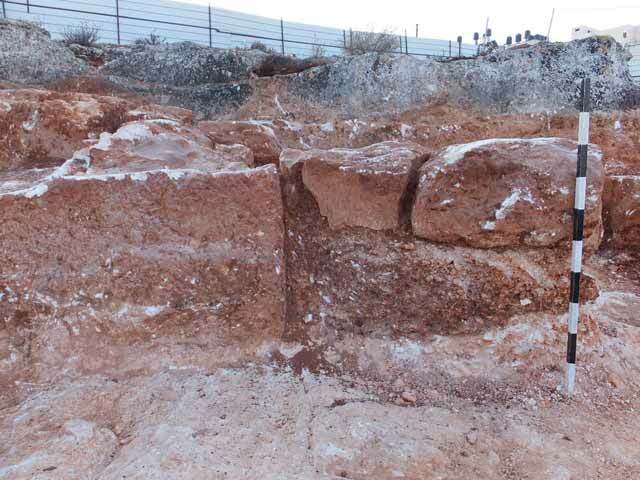 The quarries unearthed in the excavation, along with many other quarries discovered in the area (Adawi 2007; Yeger 2014a; Yeger 2014b), provided building stones to the city of Jerusalem and possibly to the city’s northern hinterland as well, including nearby sites, such as Khirbat Hawanit, Khirbat Magharam, Khirbat ‘Addasa and Khirbat er-Ram. 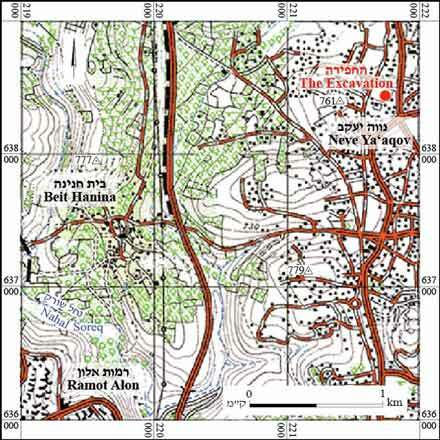 Two ancient Roman roads leading to Jerusalem passed by the Shu‘afat – Beit Hanina ridge: the Nablus road and the Bet Horon road (Kloner 2001). The proximity of the quarries to these roads facilitated the transportation of the building stones to Jerusalem and to the nearby settlements. Adawi Z. 2007. Jerusalem, Shikune Nusseiba (A). HA-ESI 119. Adawi Z. and Touri B. 2014. Jerusalem, Beit Hanina. HA-ESI 126. Safrai Z. and Sasson A. 2001. Quarrying and Quarries in the Land of Israel. Jerusalem (Hebrew). Yeger D. 2014b. Jerusalem, Shikune Nusseiba. HA-ESI 127. 3. Chisel marks from the quarrying of stones, looking north. 4. A stone still attached to the bedrock, looking south. 5. Diagonal chisel marks, looking north. 6. Courtyard 4 in the southern quarry, looking east. 7. Courtyard 5 in the southern quarry, looking northeast. 8. A layer of quarrying debris beneath Level 7, looking east. 9. Level 7 in Courtyard 5, looking south. 10. The northern quarry, looking southeast. 11. The eastern quarry, looking east.